ENJOY IMMENSE POWER WITH LESS HEAT The X52 Kraken is a powerful all-in-one CPU Hydro Cooler from NZXT. Featuring two 120mm fans, addressable RGB channels and NZXT's exclusive mirroring effect to provide beautiful lighting on your system. You can configure and control the cooler through CAM's software interface which allows you to fine-tune settings using the advanced controls optimize your performance for gaming sessions. The X52 is an industry-leading cooler that has been re-engineered to bring you supreme liquid cooling, and is all supported by a generous 6-year warranty. FUTURE-PROOF TECHNOLOGY The Kraken Series hosts a new pump that is quieter and capable of displacing more liquid than past generations. This future-proof design achieves superior cooling efficiently while keeping sound to a minimum level. INTUITIVE CAM INTERFACE Give your cooling extra flair with the X52’s on-board lighting, with advanced RGB modes and infinite-mirror effect. You can use CAM’s dashboard to personalize your lighting, with customizable presets or special reactive modes that responds to changes in your system, such as temperature and audio output. You can also independently fine-tune the pump and fan performance with ease. TWO FITTED AER P120 FANS The X52 Kraken comes fitted with two Aer P120 PWM fans, which are designed for liquid-cooling perfection. It also includes a chamfered intake and fluid dynamic bearings, which provides you with silent operation and powerful cooling. FORTIFIED NYLON SLEEVED TUBING Strong nylon sleeves are added to the cooler to fortify the rubber tubing by giving it a protective layer. Your Kraken cooler tubes will be easily shielded from potential damage during handling. 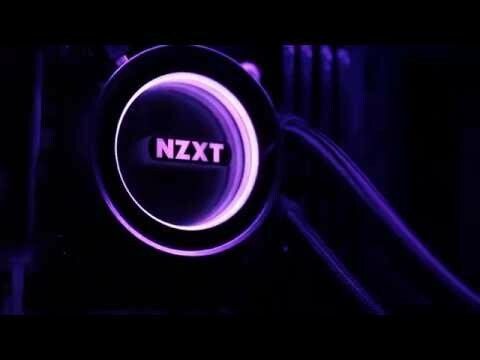 NZXT Kraken X52, All-In-One CPU Hydro Cooler with RGB Lighting, CAM Control, 2x120mm PWM Fans, 240mm Radiator is rated 5.0 out of 5 by 2. Rated 5 out of 5 by chris73 from Nice & Cooooooolllll This is my first cpu liquid cooler, it is very nicely made, runs silent ( even in the current hot weather ), does what it says on the box, highly recommended to anyone who is looking for a decent cooler, worth every penny.. Rated 5 out of 5 by GlenOrpheus from Beautiful in every aspect if you're looking at this you already know what it can do, what more can i say than best looking AIO and is quieter than my previous H100i, Luv it! Will this model fit in the top of my Game Max Onyx. As others have reported it has been near impossible to fit into this pc case thanks.